In July of 2013, the U.S. Fish and Wildlife Service declared two butterfly subspecies extinct after neither had been seen for nearly a decade. The Zestos skipper and the Rockland grass skipper joined one other species also presumed extinct in the US. Nationwide, 17 butterfly species are considered endangered. Granted, between 650 and 750 butterfly species live in the US, but the recent decline is rapid and troubling to conservationists. Since the early 1900s, miners have carried canaries into mines with them. The birds are particularly sensitive to toxic gases such as carbon monoxide, and their distress served as an early warning that conditions were unsafe for the miners. While the use has been phased out in favor of electronic detectors, many conservationists use the phrase to apply to animals such as butterflies. The insects' brief life cycles and dependency on particular conditions makes them an indicator species. Because of their extreme sensitivity, butterflies suffer the effects of environmental degradation long before the situation becomes dire enough to affect humans. Butterfly extinction spells trouble for plants, most of which require insect pollinators to reproduce. In many ways, butterflies pollinate more effectively than bees do. 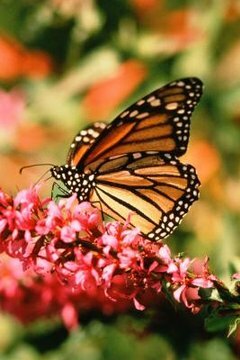 Butterflies eat nectar from flowers, but they don't collect pollen for themselves. Unlike bees, they don't have to constantly return to a hive, so they disperse pollen more widely than those more famous pollinators. The disappearance and endangerment of butterfly species potentially affects people greatly, since approximately 80 percent of food crops are pollinated by insects. Many consider pesticides an important part of efficient agricultural production since they eliminate insects that destroy crops. Homeowners also use various pest control services such as misting systems, which dispense low levels of chemical pesticides intended to kill mosquitoes and make summer days spent out in the yard more enjoyable without the worry of contracting the diseases that the biting insects carry. However, pesticides don't discriminate, and though intended to kill insects considered pests, they also kill beneficial insects including butterflies. Even where pesticides aren't used, the chemicals persist in the air and in water runoff. Habitat loss plays a key role in the extinction and endangerment of butterfly species. Forests and meadows cleared for shopping centers and housing leave butterflies without food plants or host plants to lay their eggs. As human development expands, natural habitat disappears. The smaller, more isolated butterfly populations become more vulnerable as a result. Extreme weather events such as hurricanes that previously acted merely as population control threaten to wipe out entire species already decimated by habitat loss. Suburban homeowners can help preserve butterflies by planting native plants around their homes and in their gardens.